To manage, to acquire or assist in the acquisition of local sites in order to enhance the flora, fauna and landscape. To provide educational and recreational opportunities for members of the public by allowing appropriate access to sites and in particular to provide interpretive displays, guided tours or otherwise disseminate information about the area and its flora and fauna. To acknowledge and promote the natural history and literary references made about the area by John Clare and the naturalist Charles Rothschild. Members receive quarterly a spring, summer autumn and winter newsletter. In addition on the other months they receive a list events for the next two months. The suggested annual membership is around £24 a year for an individual and £36 per joint family unit but we do not insist on a minimum membership fee. We would ask our supporters to give what they can afford on an annual basis. We certainly do not want anyone to feel that they cannot continue to be involved with the Trust because of cost. 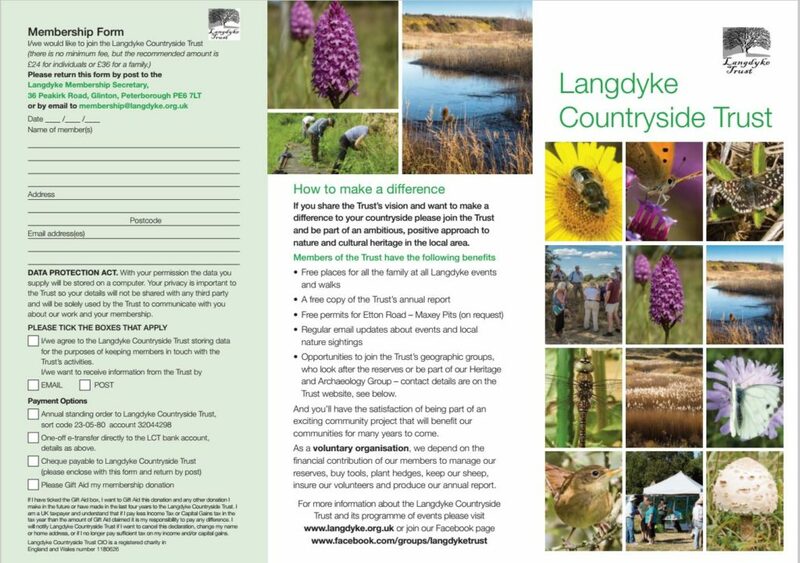 Your details will be kept solely for use by the Langdyke Countryside Trust. Your records will be updated and used in accordance with any requirements of the Data Protection Act. The Langdyke Countryside Trust CIO is a registered charity in England and Wales no. 1180626.